Distance learning allows attendees to participate in virtual programs from their offices and at their convenience. These webcasts include notable speakers and leaders in the higher education industry, and provide strategies for implementing policies, clarifying complex legislation, highlighting key research and analysis, and much more. Tuition discounting strategies. Average tuition discount rates at private nonprofit institutions increased to record levels in 2015–16, according to the NACUBO 2015 Tuition Discounting Study. Along with rising costs of student scholarships and grants, the result has led to significantly lower gains in net tuition revenue. In the upcoming webcast Rethinking Tuition Discounting Strategies, to be held on November 3, a chief business officer, a chief enrollment officer, and an industry consultant will discuss key results from the study, and the recent tuition discounting strategies implemented by CBOs to increase net tuition revenue. Attendees will learn about the complexity of factors that go into new tuition discounting, enrollment, and financial aid strategies. They will also gain insight about the relationship among the discount rate, enrollment, and net tuition revenue, and ways to bring balance to each. Addressing sexual violence on campus. Institutions are grappling with ways to prevent sexual assaults on campus. As a result, many colleges are implementing climate surveys to gain knowledge on the issue and help develop prevention programs. The webcast Sexual Violence on Campus: Implementing a Climate Survey and Follow-up Action Plan featured Sarah McMahon, assistant professor and associate director, Center on Violence Against Women and Children, Rutgers University, New Brunswick, N.J.; and Allison Randall, chief of staff, Office of Violence Against Women, Department of Justice, who shared results from the Campus Climate Survey Validation Study Final Technical Report, provided by the White House. The speakers discussed best practices and addressed ways institutions can use this free resource to develop a climate survey tailored for their campuses. Attendees also learned ways to use the survey results to develop plans to improve campus sexual assault prevention and response efforts. Return on investment support. The webcast The ROI of Student Success: Practical Considerations for Measuring and Conveying the Financial Value of Student Support Services featured a panel of student success and policy experts, who shared practical insights for assessing the value of and garnering support for effective student success initiatives. Participants addressed the role of policy, institutional culture and structure, financial modeling, and strategies for both resource-rich and resource-starved institutions. Speakers shared examples of how financial modeling has improved operations at several institutions. Participants gained a deeper understanding of the political, institutional, and individual considerations for measuring and communicating the return on student initiatives. Attendees also learned about effective strategies to better understand what’s working to drive long-term student, institutional, and state objectives. Each webcast will be available on-demand for one year from its original air date. For more information, contact support@nacubo.org. To learn more about other webcast offerings, visit the “Distance Learning” page at www.nacubo.org. Campus financial leaders can recite pertinent campus facts, such as cost of attendance, number of students, and academic programs, but it is equally important to know basic operational consumption data. After salaries, running the campus is the second highest cost for an institution. To help institutions stay on top of these numbers and raise awareness about their importance, two years ago APPA and NACUBO launched the Key Facilities Metrics Survey to gather vendor information data. These data can be used to ensure that projects are reducing energy consumption and inform staff about potential behavior changes that can improve their campus. The Key Facilities Metrics Survey, which focuses on BTU (energy), electrical, water, waste, and carbon consumption is now open. The survey does not require you to answer every question, but you should fill out as much as you can so that the data can have an impact on your future decision making. The survey—available to NACUBO members and nonmembers—can be accessed at www.appa.org/nacubosurvey16/, and will remain open until Dec. 12, 2016. For more information, contact Sally Grans-Korsh, director, facilities and environmental policy, NACUBO. 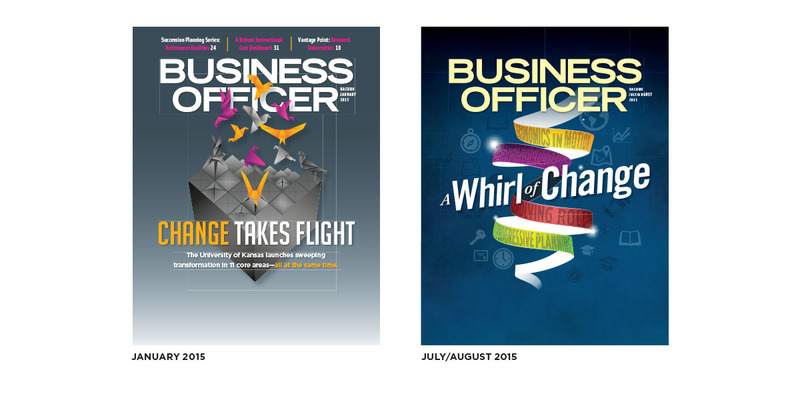 Business Officer magazine begins its 50th year of publication with the July/August 2016 issue. It has come a long way since its first issue—a bi-monthly newsletter that appeared in October 1967. The newsletter included in-depth reports along with information on NACUBO, and regional activities and plans. 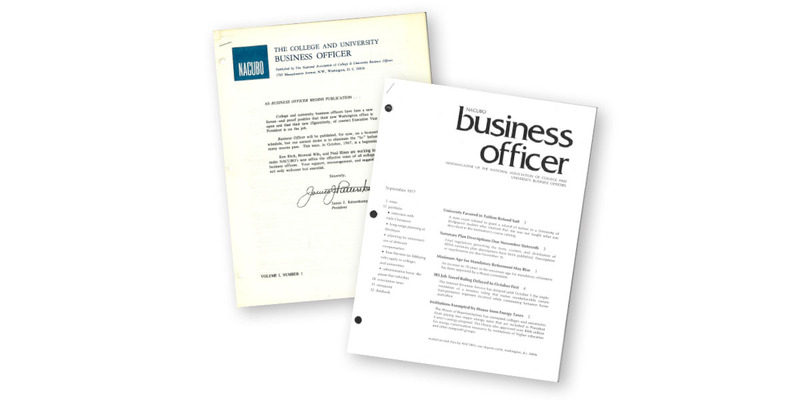 Merging the newsletter with other NACUBO publications such as Professional File, Special Reports, and Federal File. Improving mail delivery and magazine readability. The Business Officer magazine team celebrates during this year’s AM&P annual awards gala, held at the Ronald Reagan Building and International Trade Center. From left to right: Art Director Colby Waller of THOR Design Studio; Vice President, Professional Development, Marta Perez Drake; Editor in Chief Carole Schweitzer; Associate Editor Khesia Taylor; and Deputy Editor Preeti Vasishtha. 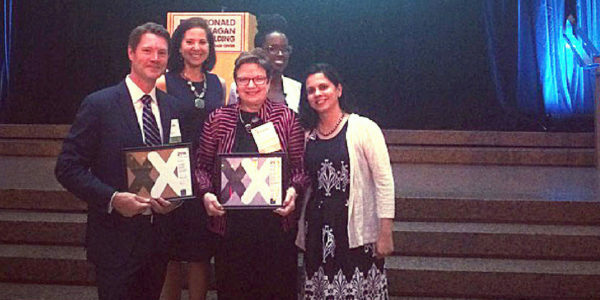 Through its EXCEL awards program, Association Media & Publishing (AM&P) honors both print and digital publications in nonprofit association media, communications, and marketing, for their creativity, excellence, and leadership. The silver award in the single-topic issue category for the “Transformative Change Hits Higher Education” feature material in the July/August 2015 issue. The bronze award in the cover illustration category for the January 2015 “Change Takes Flight” cover.